Madikeri, Feb 11: A peaceful bandh was observed in Kushalanagara town on Monday by the members of Cauvery Taluk Horta Kendriya Samithi demanding the formation of Cauvery Taluk. 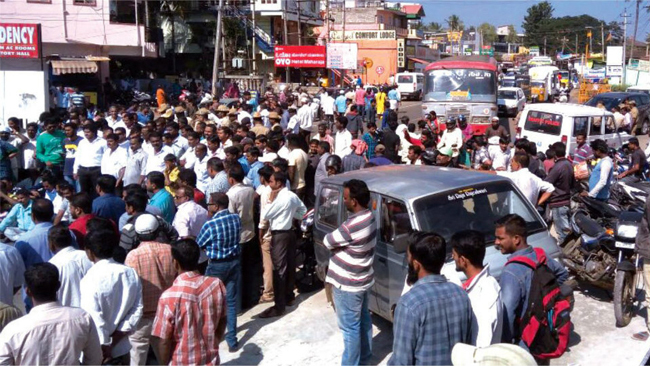 Schools and Colleges in the Taluk remained closed, Commercial establishments, petrol bunks and other activities came to standstill in support of the Bandh. Kushalanagara Chamber of Commerce extended support to the Bandh call. vans, autos and other public transport vehicles were off the roads. However, Public KSRTC bus service was normal with police prevented the protesters from stopping the bus service.